Each will have understood it: to make a collection generally - and particularly a collection of rcoins in current monetary unit - has a cost. Every coin went out of the commercial circuit. See the link on the definition of Eurocol. We can begin to collate a set of different coins, without neglecting a "double" ("copy") of the same coin. For Eurocol, a big part of incoming coins are at the origin an exchange. You saw the limitations and the searches made for this collection. But we can make simpler at the beginning and look for only a unique event ( the same link). As for the national coins, not to take into account of the year, nor the coins has or b according to the search made by Eurocol, or details as the Belgian coins and to collect a single copy in every national series. It represents 8 coins x 35 series = 280 coins. Openly, each of us affected more than 60 % the aforementioned coins and it is relatively easy to find 180 different coins in a few months. There also, the notion of exchange is essential. Certain coins seem common but are not easy to find; on the contrary, "distant" coins geographically are easy to recover because they are emitted in large numbers. 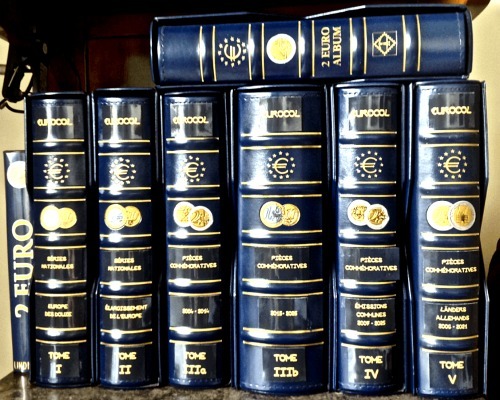 Eurocol classified the particular coins in a detailed way. But they are only commemorative coins. They can be integrated as the others to simplify itself the life. Concerning the German coins which are the only ones to be emitted in 5 copies following 5 workshops of engraving of the Country, Eurocol account 5 coins, but we can content themselves with a copy of each. It seems to me necessary to preserve all the coins of the series " in common broadcast ", even with a single German coin, but not to include the series there " on 2013 - 30 years of the Treaty of the Élysée " added by Eurocol. On approximately 300 coins at present, 150 can be found in a few months. A single rule : " have the reflex to return the coin " which falls in our hand and to judge if it is "interesting" or not. To begin this type of collection, it is necessary credit note of the order from the beginning. There is a large number of coins, it is thus necessary to classify them on one hand by locating them, then to tidy up them. As the philatelists or other collectors, certain coins are "more or less attractive" and can be esteemed more expensive than their nominal or facial value; they are only 2€ coins ! The coin 2007 - Princess Grace of Monaco signed by her engraver is sold about 2000 €.